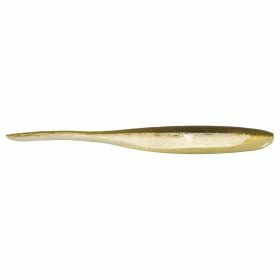 The Keitech 4-Inch Shad Impact was designed to produce a shad bait which maintains a horizontal swimming posture. This required several different type of plastics to be combined into one bait. Thanks to the Keitech original custom two-tone injection process, it is now possible. The top section of the bait is produced with a no salt light weight plastic; the bottom is a heavier salted plastic. This combination provided the balance necessary to achieve the goal. Both sizes can be fished weightless and work great on a split-shot or Carolina-rig. Our Pro-staff has had remarkable results rigging the shad impact upside down on the larger size super round and fishing it shaky style.